A blog mostly about Warhammer 40,000 and Fantasy with a focus on painting and tutorials. Here's a link to the Ultramarines Tutorials I've done so far, as well as a link to the Youtube playlist with the video versions. Some pictures and articles about Hobby projects (mostly Warhammer related). Please check out my projects and feel free to post questions or comments. Check out my youtube and Instagram channels for videos and content. 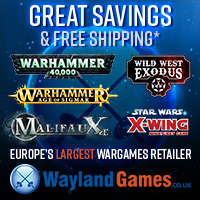 This web site is completely unofficial and in no way endorsed by Games Workshop Limited. All miniatures © Games Workshop unless stated otherwise. Used without permission. No challenge to their status intended. All Rights Reserved to their respective owners.